The MicroMet has been specially developed for gravure printing and optimally fulfills high market demands for relia­ bility, speed and ease of use. Every printer or cylinder manufacturer in the gravure printing industry needs to determine layer thicknesses. 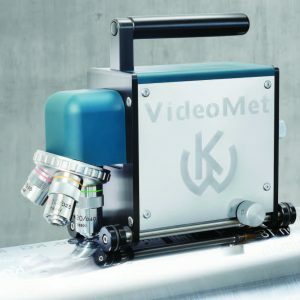 The MicroMet enables fast, reliable and above all, non­destructive measure­ ment. The core of the device is the dual probe that can measure copper and chrome layer thickness in one step. MicroMet is suitable for controlling incoming and outgoing cylinders as well as for damage analysis. It rapidly deter ­ mines layer thickness with much more precision than conventional devices. The specially developed chassis guarantees precise probe guidance and centered positioning on the cylinder. The high level of reproducibility of the determined values creates pro­ duction security; the touchscreen and intuitive menu naviga­ tion enable easy usage.